Introduction: Using cemeteries to teach local history provide many opportunities to provide local context for national topics. Everything from the location of the cemetery in relation to the larger town to the art of the gravestones provides invaluable information about how members of that community viewed death and life. How a cemetery is used in the classroom is largely determined by what it is that is being studied. Are you looking to see the impact of disease or mortality on the make-up of the town? Do a survey of individual stones to see what patterns develop. Are you looking at wealth distribution and social status? Compare the complexity of stones within the same 10-20 year period. If you are looking to see how the community�s perspective on death has evolved over time, than take a look at several sections of the cemetery and chart the changes in iconography, structure and location of gravestones. General Teaching Tips: Provide information on the Cemetery you will visit with students: its location, who owns it, runs it, role in community. Check it out ahead of time so that you are comfortable leading the trip and your activities are relevant. If you use the sheets on gravestone symbols the students will locate, be sure there are good examples to find. If you are dividing up the cemetery in sections so that detailed work can be done on a specific area, find similar-sized areas that allow comparisons. Modify the templates to the specifications of your cemetery. Check (with cemetery superintendent, cemetery commissioners, town clerk, historical society, whoever is in charge) to see if rubbing is allowed in the cemetery. Get permission and/or a permit as required. Become educated; learn how to rub responsibly. Use a soft brush and plain water to do any necessary stone cleaning. Make certain that your paper covers the entire face of the stone; secure with masking tape. Use the correct combination of paper and waxes or inks; avoid magic marker-type pens or other permanent color materials. Test paper and color before working on stone to be certain that no color bleeds through. Leave the stone in better condition than you found it. Take all trash with you; replace any grave site materials that you may have disturbed. Don't attempt to rub deteriorating marble or sandstone, or any unsound or weakened stone (for example, a stone that sounds hollow when gently tapped or a stone that is flaking, splitting, blistered, cracked, or unstable on its base). Don't use detergents, soaps, vinegar, bleach, or any other cleaning solutions on the stone, no matter how mild! Don't use shaving cream, chalk, graphite, dirt, or other concoctions in an attempt to read worn inscriptions. Using a large mirror to direct bright sunlight diagonally across the face of a grave marker casts shadows in indentations and makes inscriptions more visible. Don't attempt to remove stubborn lichen. Soft lichen may be thoroughly soaked with plain water and then loosened with a gum eraser or a wooden popsicle stick. Be gentle. Stop if lichen does not come off easily. Don't use spray adhesives, scotch tape, or duct tape. Use masking tape. Don't use any rubbing method that you have not actually practiced under supervision. What is the name of this cemetery? In what community is it located? Locate the cemetery on town map. Describe its location, size and immediate neighbors. Why do you think this site was selected? What does the location of the cemetery tell you about the relationship between life and death in the community? Who is buried here? Look for names that are found throughout town (names of schools, streets, ponds, etc.). What years are covered in this cemetery? List oldest and most recent you find. Identify the oldest and newest stones in the cemetery. How have they changed over time? What kinds of gravestone shapes do you find and what symbols are on them? Find several gravestones that look very similar and might be carved by the same carver. What were his favorite symbols and inscriptions? List the name of the carver if found on the gravestones. Read several epitaphs and write out your favorite. Read poetry or literature that relates to graveyards, death and dying and write an epitaph for a poets or authors you are reading. Or if you are studying the community, write epitaphs for leading townsmen and women. Identify stones representing different levels of wealth and status in the community. How do these stones reflect the economics of the community? Do a survey of gravestones that have natural and human damage. They might be broken, knocked over (human), eroded from rain, wind or be affected by plant material, lichen (natural). Consider the kind of stone used and determine which kind is most, least durable. Comment on the different methods of writing inscriptions on the stone and effectiveness. Do a statistical study of life expectancies during a particular period of time and note causes of death. Make comparisons between different periods. Look for evidence of infant mortality, wars, epidemics etc. What are the differences between male and female life expectancy? What might account for this? Last Great Necessity: Cemeteries in American History (Creating the North American Landscape) by David Charles Sloane Johns Hopkins University Press; (May 1, 1991) An excellent book for understanding the cultural significance of the evolution of cemeteries in North America. Of particular note is the section dedicated to the Mount Auburn Cemetery in Cambridge. Most of the larger trends in the development of cemeteries are discussed in depth and examples are provided. Also makes the distinction between the different types of cemeteries: burial grounds, graveyards, cemeteries, etc. and their locations relative to the larger community. by Allan I. Ludwig Wesleyan University Press; 1st edition (September 1, 1975) This text is essential for anyone focusing on the symbols found on the stones. An excellent primer. 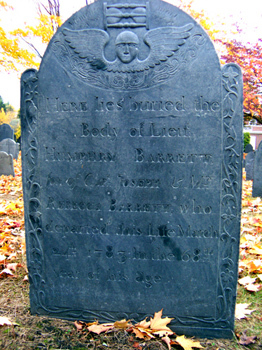 "Farber Gravestone Collection" American Antiquarian Society, Worcester, MA http://www.davidrumsey.com/farber/view.html The Farber Gravestone Collection is an contains over 13,500 images documenting more than 9,000 gravestones, most made prior to 1800. Superb images from many towns in Massachusetts and elsewhere in New England. "Early New England Gravestone Studies" (High School level) Dean Eastman, Beverly High School, Beverly, MA. Materials and assignments for the course " Primary Research through the History of Beverly". "Cemetery Studies" (8th grade). Sample general lesson plans about local graveyards, as well as graveyard-related lesson ideas for various subjects. Worthwhile content, a rather uneven website. "A Study of Local History Through the Examination of Community Cemeteries" - Steve Kocur, Old Rochester Regional Junior High School, Mattapoisett, MA. Lessons cover Gravestone Symbols & Epitaphs, Mapping a Cemetery, Studying Gravestones, Coordinating Your Data. "A Grave Undertaking" A history-based inter-disciplinary unit for eighth grade focusing on Deerfield. Six lesson plans, including "Cemetery Research Organizer" worksheet.